Pauline E Meyer, 88, of Fort Wayne, passed away on April 2, 2019, at Chapman Place Assisted Living in Fort Wayne. Born in Jefferson Township, Noble County, IN, on December 26, 1930, to James and Eva Mae (Hanson) Rodman. She spent her formative years in Noble County. Pauline married Theodore W. Meyer on December 24,1951. The couple then moved to Eel River Township. She worked at Siefert Foods for 23 years, retiring in 1992. She attended Wallen Baptist Church, where she was a member. Pauline was also a member of the Crescent Home Ec Club, Knit-Witters Club and Twinless Twins Club. She was a factory worker, a farmer's wife, loved chickens and her dog, Missy. Pauline is survived by three sons, Ronald W. (Maggie) Meyer of Herald, CA, Paul R. (Janeie) Meyer of Churubusco, Ernest A. (Kathy) Meyer of Harlan; eight grandchildren and numerous great-grandchildren. 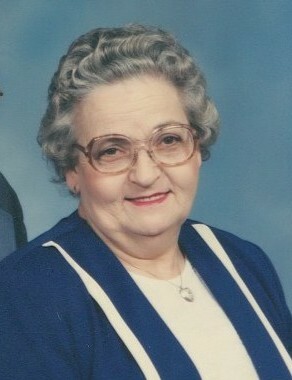 She is preceded in death by her husband, Ted; one son, Carl; two daughters, Eva Kay and Elizabeth Evelyn; ten brothers, William "Bill", Ray, Charles, Howard Sr., Ralph, Forrest "Pete", Danny "Bud", Kenneth and her twin, Paul Rodman; four sisters, Ruby Reed, May Lesley, Wava Duckworth and Mary Keller. Visitation will take place Friday, April 5, 2019, from 1-3 PM and 6-8 PM at Sheets and Childs Funeral Home, 206 N. Main Street, Churubusco, IN 46723. Viewing also one hour prior to service on Saturday. Services will begin Saturday, April 6, 2019, at 11:00 AM, at the funeral home, Pastor John Suciu officiating. Burial will take place at Fairview Cemetery in Huntertown, Indiana.